Book Description: This textbook emphasizes connections between theory and application, making physics concepts interesting and accessible to students while maintaining the mathematical rigour inherent in the subject. Frequent, strong examples focus on how to approach a problem, how to work with the equations, and how to check and generalize the result. Introduction to Electricity, Magnetism, and Circuits by Daryl Janzen is licensed under a Creative Commons Attribution 4.0 International License, except where otherwise noted. This work, Introduction to Electricity, Magnetism, and Circuits, is a derivative of University Physics Volume 2 by Samuel J Ling, Jeff Sanny, and William Moebs, used under a CC-BY 4.0 international license. 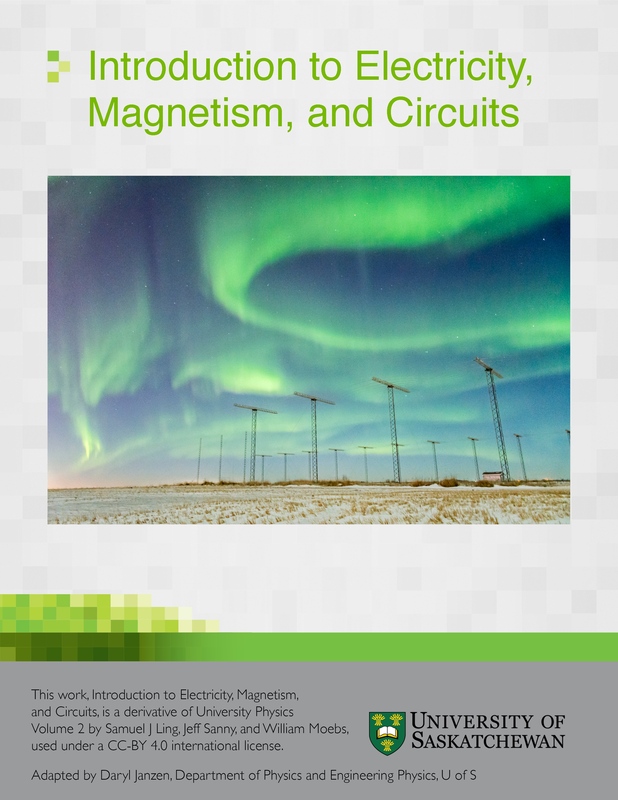 Introduction to Electricity, Magnetism, and Circuits is licensed under a CC-BY 4.0 international license by Daryl Janzen, Department of Physics and Engineering Physics, University of Saskatchewan. Cover image: “The Auroral Radar” by Ashton Reimer won first prize in the “Research in Action” category in the University of Saskatchewan 2016 Images of Research contest, and is used here with permission. It depicts the aurora borealis, or Northern Lights, seen over the Saskatoon SuperDARN (Super Dual Auroral Radar Network) radar. On December 20th, 2015, a large geomagnetic storm produced this show, which was caused by the impact of two successive coronal mass ejections from the Sun. While storms produce beautiful aurora, they also produce adverse effects on airplane communications systems, GPS, and the electrical power grid. SuperDARN radars measure the velocity of the aurora, in a manner similar to a police radar gun, and this radar data is an essential tool used in space weather forecasting, which can predict the intensity of these effects.